After neutering, your cat will go through various physical changes – at this time, a change in its diet may be required to continue to provide nutrients that support its good general health. 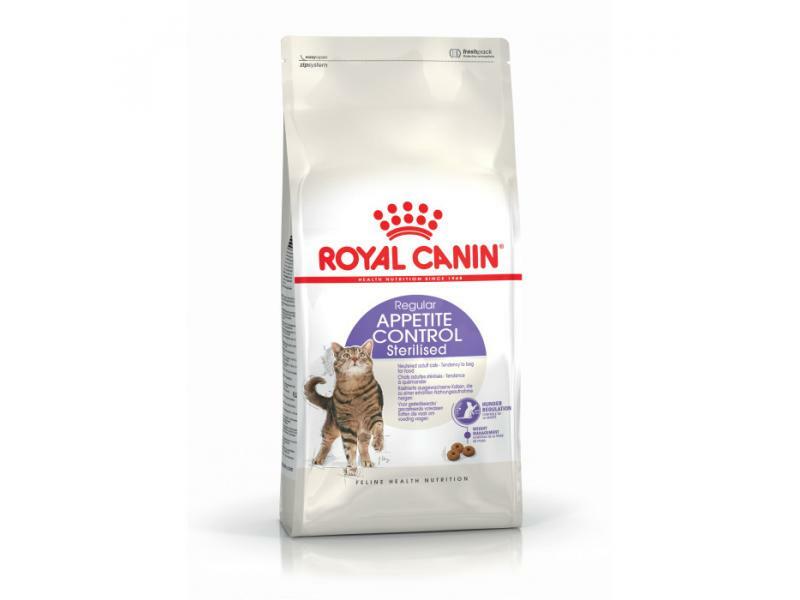 ROYAL CANIN® Appetite Control Sterilised contains a high level of specific fibres which both satisfy the appetite of cats like yours who may have a tendency to beg for food, as well as reducing your cat’s feelings of hunger in a natural way. ROYAL CANIN® Appetite Control Sterilised also contains a specific balance of minerals to help support and maintain your cat’s healthy urinary system. Thanks to the moderate level of fat in ROYAL CANIN® Appetite Control Sterilised, the risk of your cat gaining excess weight is significantly reduced as the nutrients help your cat to feel satisfied and full after eating. Regular Sterilised Appetite Control for neutered cats from 1-7 years old. Tendency to beg for food. Hunger regulation - After neutering, certain cats are less able to regulate their food intake. APPETITE CONTROL STERILISED contains a high level* of specific fibres which help to satisfy the appetite of cats, reducing the feeling of hunger. * Compared to a high quality maintenance food. Weight management - Helps limit the risk of excess weight gain thanks to a moderate level of fat. Urinary health - Helps support a healthy urinary system by providing an adequate mineral balance. Enriched with L-Carnitine - L-Carnitine is involved in healthy fat metabolism. Vitamin A: 19000 IU, Vitamin D3: 700 IU, E1 (Iron): 36 mg, E2 (Iodine): 3.6 mg, E4 (Copper): 11 mg, E5 (Manganese): 47 mg, E6 (Zinc): 140 mg, E8 (Selenium): 0.06 mg, L-carnitine: 200 mg - Technological additives: Clinoptilolite of sedimentary origin: 10 g - Preservatives - Antioxidants. *L.I.P. : protein selected for its very high assimilation. Dehydrated poultry protein, maize, vegetable fibres, vegetable protein isolate*, wheat, maize gluten, hydrolysed animal proteins, animal fats, rice, beet pulp, yeasts and parts thereof, minerals, soya oil, fish oil, fructo-oligo-saccharides, psyllium husks and seeds. Crude ash: 7.8%. Crude fibre: 9.2%. Crude oil fats: 12%. Moisture: 0%. Protein: 34%. There are currently no questions for ROYAL CANIN® Feline Health Nutrition Appetite Control Sterilised Adult Dry Cat Food - be the first to ask one!